Why do some of MUFON's gallery of alien entities rate both a head view and a full-body view? Why do entities M and P get two pictures while entities N and O only get the one? We will probably never know, which is good, because that opens the door to wild speculation. It's not as if the full-body views of entities M and P really add any worthwhile new information. Do I want to see entity M's choice of sleepwear? No. Do I care that entity P has discovered the lie around, lounge around pleasures of Forever Lazy? Please. Does any of this information help us get to the bottom of the UFO enigma? Not one bit. And yet, there is more information, and, thus, greater impact, in two images then there is in one. So why are the extra images there for some entities, but not for all? To me, this is nothing less than subliminal manipulation. In my opinion, the MUFON Staff Artist includes extra views of certain entities because he knows this will make more UFO witnesses identify those aliens as the one they encountered. That would mean that MUFON's entire alien entity identification database, if such a thing actually exists, which it must, is fatally flawed. 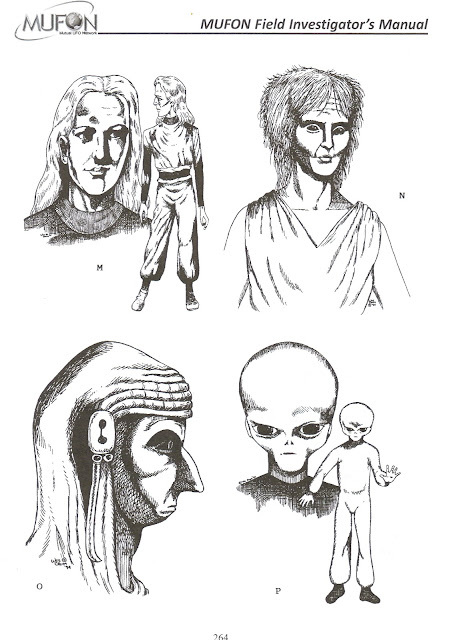 I bet that if I asked the MUFON archivist, if such a thing actually exists, which it must, how many of each of the 16 alien entity types shown in the MUFON Field Investigator's Manual have been identified by UFO witnesses, we would find that the entities with two views are picked far more often than those that are not. Meanwhile, poor, inexplicable entities N and O must never get chosen at all. Which makes sense in any case, because they're both extraordinarily mental, even by MUFON's standards. Looking deeper into the imagery, though, we find that the two views of entity M are gazing admiringly at each other, as if this entity was from a planet of narcissists... Entity N has eyes, but do they see? Entity O is staring intently at entity P, seemingly envious of P's Forever Lazy (which, not surprisingly, comes in grey). I am also convinced that there is a hidden message in entity P's strange traffic cop stance. Is P telling us to "halt" our investigations into the UFO phenomenon? 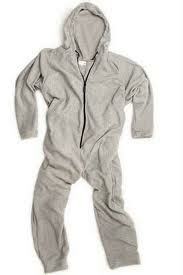 Forever Lazy in "Asleep On The Job Grey." It' s very comfortable, right up until the moment you disintegrate.